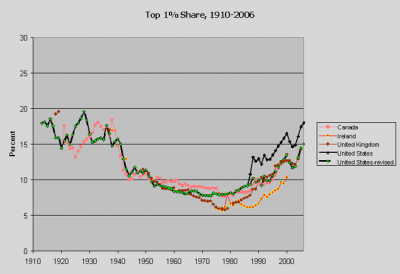 Scott Winship has questioned Thomas Piketty and Emmanuel Saez‘s widely used data on US economic inequality. Their data show inequality declining sharply from the 1930s through the 1970s, and then increasing substantially between the 1970s and the 2000s. 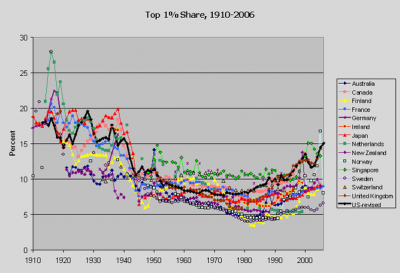 The Piketty and Saez data (.xls) are particularly valuable because they cover almost a full century (from 1913 through 2008) and reach to the very top of the income distribution. In the figure below, Winship presents a version of the Piketty and Saez data that allows for international comparisons through 2006. In this case, the comparison is with other English-speaking countries. Source: Scott Winship analysis of data from Alvaredo, Atkinson, Piketty, and Saez. Winship believes that Piketty and Saez ignore the effects of the Tax Reform Act of 1986 (and, though he doesn’t mention it here, the earlier Economic Recovery Tax Act of 1981). According to Winship, tax changes in the 1980s gave top taxpayers incentives to report income on their personal tax forms that they would have reported as income on corporate tax forms before the reform. If Winship is correct, this would have led to a one-time jump in measured inequality as the rich merely transferred income from the tax returns of the corporations they own (where it used to reside) to the tax returns for their personal income (where it would now appear as “more” income for those at the very top). But, Winship’s criticism of the data is weak and, even if true, has almost no impact on any discussion of the economics and politics of the last thirty years. First of all, Piketty and Saez are well aware of the changes in 1986 tax code and of issues surrounding tax reporting more generally. The two economists factored these issues into their original analysis and, in a piece posted on Saez’s web page, have directly addressed the concerns that Winship raises. Winship has repeatedly criticized Piketty and Saez on this point, but to my knowledge he has never engaged their response (and definitly does not do so in his post this week). Alan Reynolds points out that reported incomes may not reflect true incomes because of tax evasion or tax avoidance. This is a legitimate concern and we, along with a number of colleagues, have actually spent substantial time investigating this issue. Alan Reynolds has picked some of the facts in order to provide a very skewed view. Most of the scenarios described by Alan Reynolds, such as a shift from corporate income to individual income or from qualified stock-options to non-qualified stock options, would imply that high incomes used to receive capital gains instead of ordinary income. For example, a closely held C-corporation which does not distribute its profits increases in value and those accumulated profits would appear as realized capital gains on the owner individual tax return when the business is sold. Yet, our top 1% income share series including realized capital gains has also doubled from 10.0% in 1980 to 19.8% in 2004. In contrast to what Alan Reynolds suggests, there is a debate among economists on whether reported incomes respond to tax rates. The emerging consensus is that there can be substantial responses in the short-run due to retiming of income such as realizing capital gains before a tax rate increase, but that the long-term response is small. For example, as shown by Austan Goolsbee at the University of Chicago, the Clinton 1993 top rate increase from 31% to 39.6% did induce executives to exercise their stock-options in 1992 instead of 1993 but executive pay resumed its dramatic surge after 1994. Indeed, our series focusing exclusively on W2 wage and salary income (therefore excluding both business income and capital income), show that the top 1% wage income share has increased from 6.4% in 1980 to 11.6% in 2004, no doubt a very large increase as well. It is not at all clear, once you hear both sides of the story, that Winship’s proposed adjustments are necessary. 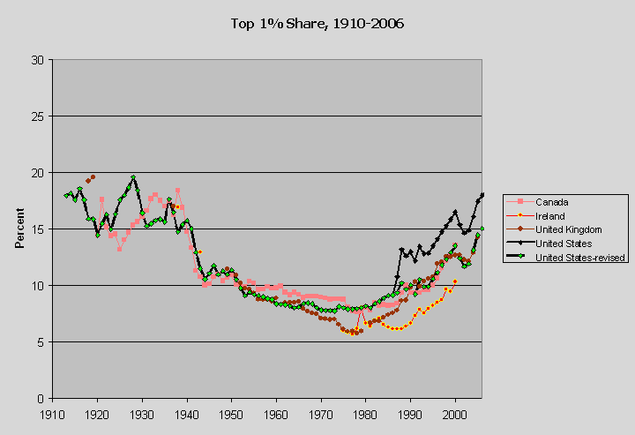 In fact, if Piketty and Saez are correct, Winship’s adjustments would distort the actual record. Second, even if we accept the totality of Winship’s adjustments to the data, it does not change, in any material way, the critique generally made by the left. 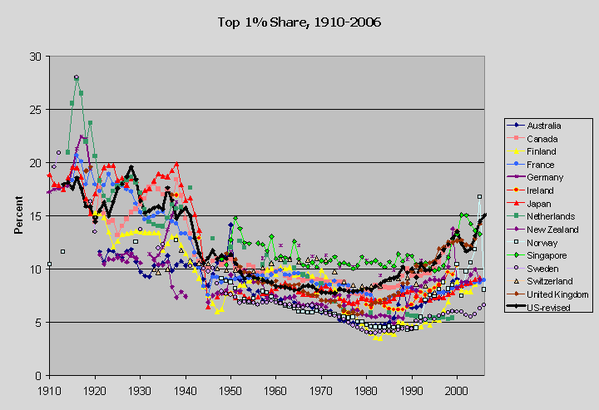 Like many critics of recent economic developments, I frequently cite (pdf) the Piketty and Saez data to make two simple points: first, that economic inequality was falling or flat over the five decades from the 1930s through the 1970s; and, second, that inequality has increased sharply since the 1970s. Winship’s adjusted series does not change the first point about the 1930s through the 1970s because his modifications kick in only from the second half of the 1980s. And even after his proposed adjustments, economic inequality has still increased substantially over the past thirty years. Eyeballing from his figure that fully incorporates his adjustments, the share of income received by the top one percent almost doubled from about eight percent of income in 1979 to about 15 percent in 2006.